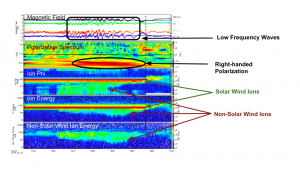 A variety of plasma waves have been observed in the lunar plasma environment. These include waves near the ion cyclotron frequency–around 0.01 Hz. One generating mechanism for these waves is resonant interactions with non-solar wind ions, such as those reflected from localized crustal magnetic fields on the lunar surface. Both right and left hand polarization is displayed by the waves, but, due to the Doppler shift from the solar wind, the observed polarization is not necessarily the same as the intrinsic polarization. My research project focuses on the characteristics of these waves and the conditions under which they occur. I use a combination of observational data, ion tracing simulations, and wave analysis. To find instances of these waves, I look for simultaneous observations of reflected ions and 0.01 Hz waves in data collected by the twin Acceleration, Reconnection, Turbulence and Electrodynamics of the Moon’s Interaction with the Sun (ARTEMIS) spacecraft. Comparing the solar wind and interplanetary magnetic field (IMF) parameter distributions during these wave events to the parameter distributions from accumulated ARTEMIS data allows me to look for preferred ambient conditions during which these waves occur. By combining the cyclotron resonance condition with the Doppler shift due to the solar wind, it is possible to determine the intrinsic properties of waves generated by a range of ion velocities. Running ion tracing simulations using the same ambient solar wind and IMF conditions as those of the observed events produces the spatial and velocity distributions of ions in regions detectable by the spacecraft during the event times. Using these simulated ion distributions, I try to determine the intrinsic polarization and propagation direction of the observed waves.